We’re constantly on the lookout for the adjustments pitchers make. We love being able to spot where the game of baseball is changing, and you never know when a pitcher’s next tweak might vault him into another performance level. Felix Hernandez became Felix Hernandez when he picked up a reliable change. Dallas Keuchel became someone worth knowing when he developed a dependable slider. Mariano Rivera didn’t even have a cutter when he was coming up in the minors, and so on and so forth. It’s easier to spot changing pitchers than changing hitters, and when one thing about a pitcher changes, sometimes you can end up with a whole different profile. Now, often, when we’re looking for changes, we’re comparing against previous years. And that makes some sense — depending on the adjustment, they’re frequently rolled out and tested in spring training. But it’s also possible to spot some midseason adjustments, with perhaps the simplest adjustment being a change to the pitch mix. 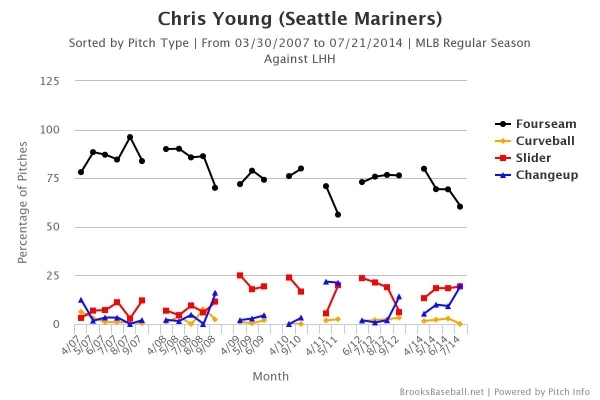 Let’s take a look at that for 2014, inspired by something I’ve noticed about Chris Young. I’ve had a note to write about this for a week or two. I guess now I’ve waited long enough. There’s no general trend of greater success. Comparing the last month to the first month, just four of 10 guys have posted lower ERAs. Just four have posted lower FIPs, and five have posted lower xFIPs. So the group, as a whole, hasn’t taken a step forward — but then there are the individual points of interest. Tanaka, more recently, pitched far worse. But he might’ve also been pitching hurt. Samardzija has gotten back to a more familiar splitter rate, and he’s achieved some more familiar peripherals. Richards is an interesting player to note here. In April, three-quarters of his pitches were fastballs. Each successive month, he’s decreased his fastball rate and increased his slider rate; each successive month, he’s improved his K% – BB%. A little bit of that works in the other direction. In strikeout counts, Richards is likely to throw more sliders. But having a better slider is a big part of Richards’ emergence, and he’s finally pitching like the ace observers pictured when they saw his velocity. And then there’s Young. When Young resurfaced with the Mariners, he was extremely fastball-heavy. This didn’t surprise, because Young has always been extremely fastball-heavy. In April, he threw 77% fastballs, right around his career mark of 73%. But then, over the past month, Young has thrown just 56% fastballs. He started against the Angels on Sunday and threw 51 sliders. As far as PITCHf/x knows, that was a career high by 15. In terms of slider rate, Sunday’s 52% clobbered Young’s previous known high of 41%. Chris Young is the most interesting player on this list, because he’s an established veteran doing something he’s never really done before. Young is still an extreme fly-ball pitcher. But, in the season’s first month, he had more walks than strikeouts. Over his past seven turns, he has six walks and 35 strikeouts. When Young began the season with an acceptable ERA and dreadful peripherals, the suspicion was the ERA would regress. Instead it’s like he’s gone the other direction, having massively lowered his xFIP. Against righties, Young’s fastball has dropped to levels never before seen from him, with the slider making up all the difference. He’s actually thrown more sliders than fastballs to righties since the beginning of June. Against lefties, there’s been a slight increase in slider rate, but there’s been a sharper increase in changeup rate, to help offset the fastball reduction. The changeup hasn’t often been a weapon for Young before. In effect, Young is pitching like a righty specialist against righties. Against lefties, he’s looking like a bona fide three-pitch pitcher. Making it all the more interesting is Young defended his fastball-heavy approach in conversing with Eno just this May. Young was right in identifying weak spots up in and around the zone, and he was right that a fastball can function as multiple different pitches — depending on where it’s put. Yet after defending his unique blend of stuff and approach, Young has changed the way he pitches. He’s thrown fewer elevated fastballs and has thrown more secondary stuff over the outer half. We’ll only see from here for how long this sustains, but I suppose a player sharp enough to talk to Eno like Young did is a player sharp enough to figure out when a change might be helpful. A good goal is to stay one step ahead of the scouting report, and no scouting report in the world cautions hitters against Chris Young’s secondary stuff. There’s a thought out there that throwing sliders is bad for the arm. Few pitchers have injury histories comparable to Young’s. So maybe, on the surface, this seems like a bad idea. But it’s not like staying with fastballs has kept Young healthy in the past. And when Young underwent surgery for thoracic outlet syndrome, doctors told him they figured they’d address the root cause of his arm problems, so maybe Young’s just testing that to the extreme. 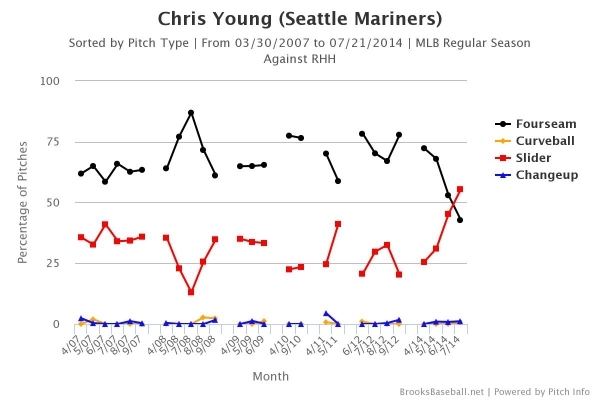 One way or another, it’s 2014 and Chris Young is helping a contending team’s rotation. You have to give Young that much credit. We hoped you liked reading Chris Young and Dropping the Fastball by Jeff Sullivan! If you are so good at dropping stuff how about dropping some weight?